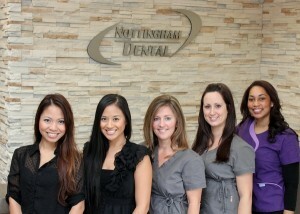 Our Nottingham Dental office is located right at 75 Williamson Drive West and Westney Road North, in unit #4. If you are looking for a great dentist for you or your family, please give us a call. We welcome new patients and referrals. If you have any questions, concerns, or would like to schedule an appointment, please contact us today. At Nottingham Dental, we understand that things may come up and you may not be able to keep your appointment. We ask that you call us to let us know as soon as you can and we will be happy to find another time that would work for you. We need 2 business days notice to cancel a confirmed appointment and avoid a short notice cancellation fee. We do this because the time we’ve reserved for you in our schedule is very valuable; to you and to us. Appointment times are in high demand and if we are able to offer the time to someone who can confirm the appointment, it is our office policy to do so. In order to provide the highest quality care on a sound basis, at Nottingham Dental, we have developed convenient payment options for you to choose from. Prior to proceeding with the treatment, fees and financial arrangements will be discussed with you. Interest-Free payment plans are available depending on the qualification and amount of treatment. Ask us for more information. Nottingham Dental is proud to offer convenient in-house dental treatment financing. Ask us for more details!